Bellew v Haye 2 enhanced odds - Get 5/1 Haye or 16/1 Bellew to win at 888sport! 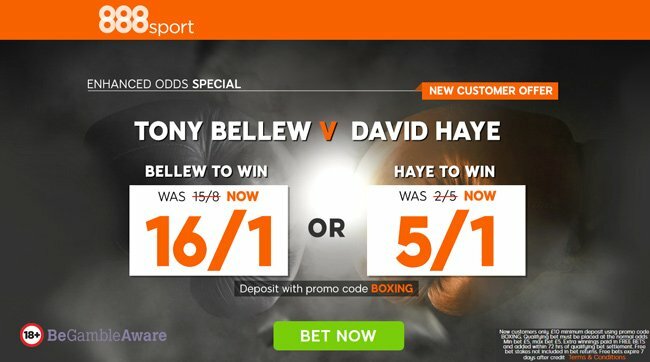 Bookmaker 888sport is offering new customers the chance to claim two massive price boosts for Saturday night’s big heavyweight boxing match – 16/1 Tony Bellew or 5/1 David Haye to win! Max bet £5! Will David Haye avenge his shock defeat to Tony Bellew or will ‘Bomber’ beat the former world heavyweight champion once again? Whatever fighter you are backing you can claim a massive price boost at 888sport! 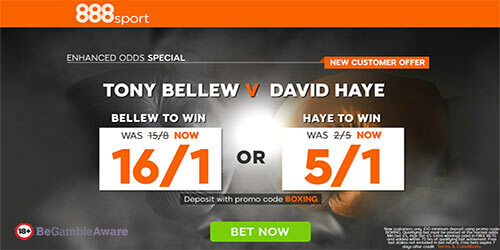 Get 5/1 David Haye or 16/1 Tony Bellew to win with 888sport! Register a new account with 888sport before the start of the fight and claim 16/1 Bellew or 5/1 Haye to win the bout - Max bet £5!! If your selected fighter wins the bout, 888sport will pay out at the advertised price immediately. They will top up your additional winnings within 72 hours. 888sport is one of the most dynamic, innovative and trusted online betting companies in the world. 888sport provides live sport betting odds for scores of events, as they happen, every day, allowing our players to watch sporting events and bet on the outcome. Players are rewarded with premium betting promotions and a terrific welcome bonus. New customers only. £10 minimum deposit using promo code BOXING. Qualifying bet must be placed at the normal odds Min bet £5, max bet £5. Extra winnings paid in FREE BETS and added within 72 hrs of qualifying bet settlement. Free bet stakes not included in bet returns. Free bets expire 7 days after credit. T&C’s Apply. 18+|Gamble Aware. Since then Bellew has been allowed more time to grow into the weight and can cope with this version of David Haye. He knows how to survive and how to negate a fight and nullify a fighter’s strengths. The Liverpudlian is the endurance athlete between the two and if he can make it through the first five rounds relatively unscathed, he can seize control. Normal odds on Bellew to win? 15/8 at maximum! 16/1 with 888sport through this page! Haye was beaten in the first fight against Bellew, but it was clear that the he teared his Achilles tendon in the sixth round. The Hayemaker was ahead on the scorecards first time around until the injury occurred. This time around, Haye claims to be more athletic and more committed. He has a new team around him for the second fight. The reach is vastly different between the pair – 198cm for the Hayemaker, 188cm for Bellew. 888sport are offering all BetAndSkill readers a double enhancement on Bellew vs Haye 2, click here to get your price boost right now! Promotion is valid until the fight starts on 5th april 2018. Offer only applies to new 888sport account holders only. Existing or previous 888sport customers do not qualify. This promotion replaces the standard welcome offer. New members will receive the Enhanced Odds. Enhanced winnings paid as free bets, added withing 72 hours from bet settlement. "Bellew v Haye 2 enhanced odds - Get 5/1 Haye or 16/1 Bellew to win at 888sport!"